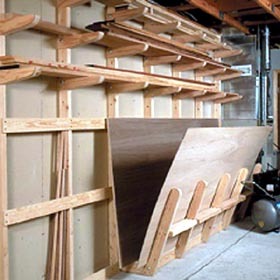 Looking for versatility in a lumber storage rack? This one's got it! Our rack features adjustable supports that attach to vertical 2x4s for holding loads of boards. The unique sheet-goods bin lets you easily sort through heavy sheets and slide out the one you want. There's even between-the-studs storage for short stock and dowels.